The Night Lords are being relentlessly hunted by the Eldar of the Craftworld Ulthwé, fleeing to the dark fringes of the Imperium in an attempt to escape their pursuers. The fickle hand of fate delivers them to the carrion world of Tsagualsa, a world where their Primarch died and the legion broken. History is fated to repeat itself once more as a deadly assassin stalks the shadows and the Night Lords are drawn into a battle they have no hope of winning. I think it's fair to say that Aaron Dembski-Bowden is right up there with the likes of Dan Abnett and Graham McNeill when it comes to writing a great Warhammer 40k novel and his Night Lords Series is amongst the finest works in recent times, not just within the Warhammer 40k world but within the scifi genre itself. 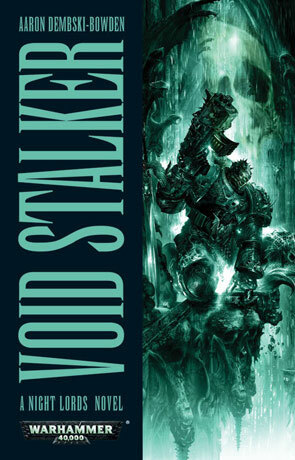 Void Stalker is the third and final novel in the series and promises to round off the epic trilogy with a style that is unsurpassed. It's a good idea to frequent yourself with the previous two novels (Soul Hunter & Blood Reaver) before reading Void Stalker, not only as it makes sense but also because they are damn fine reads too. It is however quite possible to just pick this up and enjoy it without any previous knowledge of the series and credit must go to the author for getting the balance between back-story snippets and new events just right. So Talos and his audacious band of licentious post-human killers, remnants of the Night Lords 10th company, continue along the road to their inevitable demise - stalked by the implacable Eldar. These engaging and likeable rogues are superb characters that you just can't help but feel for (despite being inherently evil) and Void Stalker builds the little foibles of each character even further. Part of the charm of the series is how each one organically develops as the story progresses and Dembski-Bowden has an innate talent in creating characters that manage to really get under your skin without you even realising it. Cyrion, Xarl, Uzas, Mercutian, Septimus, Octavia, Variel the Flayer and of course Talos all manage to grab enough screen time to do them justice while the Eldar themselves are also brilliantly described, feeling just like you would imagine such an alien race to be. The clashes with the Night Lords are just superb with descriptive prose, amazing choreography and a brutally high body count - no character is safe here. The pace is pretty hectic and the twisting story will keep you hooked from beginning to end, Black Library seem to keep improving with each new release and this has to be the pinnacle, on a par with Dan Abnett's Gaunt Ghosts series (although very, very different in style). I loved how the descent into darkness that the Night Lords take is really quite gradual and at times totally understandable, left without effective leadership after their Primarch (who let's face it was pretty negative anyway) dies they become less organised and subject to their own whims, slowly descending into chaos and looking to sew their own unique brand of terror where they can while developing mistrust of those around them. In the words of CS Lewis - The safest road to hell is the gradual one - the gentle slope, soft underfoot, without sudden turnings, without milestones, without signposts. The real star of the show is the Prophet Talos as he continues to grow and develop while struggling to deal with his gene enhanced abilities, very much a tale of the reluctant super-human lost without a leader, beset with prophetic visions and yet trying to lead a ragtag and increasingly disorganised group of chaos marines. This acts as a perfect accompaniment to the somewhat bitter-sweet tragedy as the Night Lords finally come face to face with their destiny. At the end there are 3 epilogues and each ending is simply superb, worth waiting for with each building on the last. Void Stalker a must for any Warhammer 40K fan. Written on 2nd May 2012 by Ant.